This Applet will help you write Java code. It will show you what AWT (Advanced Windowing Toolkit) fonts are available via Java on your machine and what they look like in a variety of styles, sizes and colours. This Applet will let you generate foreground and background colours from a palette of any of 16,777,216 numbered colours. This range of colour/color possibilities is known as the gamut. Use the FontShower for Swing Applet to see what you can do in Swing. Use the Unicode Applet if you want to view the entire Unicode character set. FontShowerAwt is displaying the AWT fonts available on your machine via Java. Other people will have different fonts installed and will see different selections available via Java on their machines. Your browser will see a slightly different set of fonts than this Java Applet does. Java has a few extra private fonts and some browser fonts don’t work with Java. Unfortunately, in AWT, only the basic logical fonts: Dialog, DialogInput, Monospaced, SansSerif and Serif are available for use in Labels, TextFields and TextAreas. 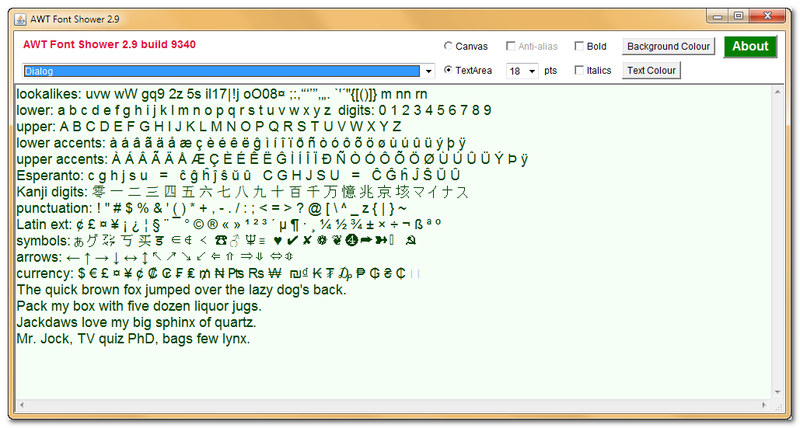 To get other fonts shown here, you must write a custom component based on Canvas and drawString. The Canvas displays were done with a custom AWT Canvas-based component. This lets you use all the fonts and all the characters in the fonts. The source code is available. The alternate vanilla AWT TextArea display is based on a native OS (Operating System) peer (as are as Label and TextField). It can only display the 5 basic logical fonts and then only some of the characters in those fonts. You have no control in Java over whether TextAreas are anti-aliased. They are rendered by the OS, not Java and hence are controlled by whether font smoothing is turned on in the Control Panel. You may not notice any difference with font-smoothing anti-aliasing. Look for the anti-alias smoothing especially in very large font sizes in capital W in the fonts with thin spidery diagonals, e.g. Bodoni, Book Antiqua, Garamond, Serif and Zapf Calligraphic. details about the current version. download source and executable to run this Applet on your own machine as a stand-alone application.